Linking up as usual with Andrea, Erika and Narci for Friday Favourites. This little face is a favourite, but he never seems to photograph as well as he looks in real life, sort of like the CN Tower. I put my wedding rings back on this week and I'm happy to have them back. I took off the top two at the beginning of the summer when I noticed them getting a little tight, but I kept the bottom band on until I went to the hospital. For some reason I left it off when I got home. I polished them up with some windex and an old toothbrush and they are good as new. My cousin and his girlfriend sent these adorable booties made out of the Nova Scotia tartan. They are cute and Q loves them (or at least he doesn't mind wearing them). Ewan McGregor was on Live with Kelly this week and I was reminded of one of my favourite movies that he is in - Salmon Fishing in the Yemen. 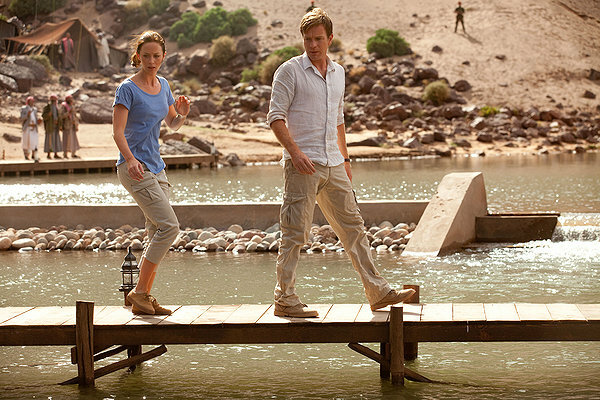 It also stars Emily Blunt, another favourite of mine. Ewan is great, and I love his accent. Ewan was actually one of the names we were considering for Q but I didn't think I would be able to say it without the Scottish accent so it was nixed. I love the Canadian ad and hashtag for telling America it is already great. Some of my favourite things that came from the US: French Fried Onions, Starbucks, Zac Efron, Michelle Obama (and Barack too I guess! ), your unabashed confidence (don't lose that), Seinfeld, and Black Friday (which has somehow become a thing in Canada now), and so much more. Birthdays and parties are my favourite. We are celebrating E's 5th Birthday today and his party is tomorrow. It has a Star Wars theme and he has invited 9 kids. I will share some photos of the party on Monday.